Anthony Segreti was born and raised in Pittsburgh, Pennsylvania. Anthony’s interest in natural history as a child led to dozens of trips to the Carnegie Museum to observe dinosaur fossils and minerals. By high school, his fascination with natural history evolved into an interest in social studies and human history. It was around that time that Anthony began to consider a career as a high school history teacher. 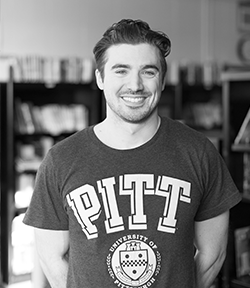 Anthony earned his Bachelor of Arts in History and Sociology and a teaching certification from the University of Pittsburgh in 2010, and began teaching at a Pittsburgh area high school. In 2012, he relocated for the opportunity to teach and design the social studies curriculum at a new high school in Newark, New Jersey. The proximity to New York City and all that it had to offer was also a factor in this decision. In Newark, he served as chair of the History Department, an instructional coach, and an advisory leader all while completing coursework to earn his Masters in Education, which was awarded by the University of Pittsburgh in 2015. Anthony spent four years teaching in Newark, and after his advisory had graduated, his attention was captured by UA Maker Academy and its unique approach to education by empowering students through the Design Thinking methodology. Anthony believes that it is vital that students develop the ability to be lifelong learners and believes that the skills learned in his classes where students learn to analyze sources, debate using evidence, and explain patterns of change is a great place to do that while using history as the vehicle to hone those skills. In his spare time, Anthony enjoys reading, playing hockey, stand-up comedy, and sharpening his culinary skills in the kitchen.